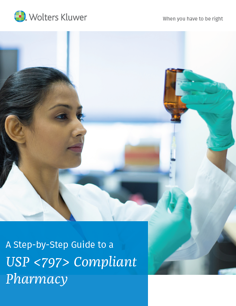 This guide will help you and your staff understand the core elements of achieving and maintaining compliance with USP <797>. Over the past century, thousands of patients have been injured or killed simply because of problems with medication preparation and delivery. One of the biggest areas of concern involves medications known as compounded sterile preparations (CSPs), which have been linked to many deaths and injuries caused by bacterial or chemical contamination. Years of efforts by concerned individuals and professional and regulatory authorities to create definitive standards guiding the compounding of sterile products finally came to fruition with the 2004 issuance of U.S. Pharmacopeia Chapter <797>: Pharmaceutical Compounding – Sterile Preparations. To access the guide, please fill out the form to the right. Simplifi797®, the #1 web-based USP Chapter 797 quality system, offers all you need to establish the training, risk management, and quality assurance practices necessary for a safe and efficient sterile compounding environment. Opt-in to receiving information regarding evidence-based research, blogs, white papers and ebooks.